On December 21, 2016, tThe President of the Islamic Republic of Iran, Hassan Rouhani, visited the Republic of Armenia on December 21, 2016. During his one-day visit, he met with the President of Armenia, Serzh Sargsyan, and the Prime Minister, Karen Karapetyan, as well as with other top leveltop-level politicians of Armenia. 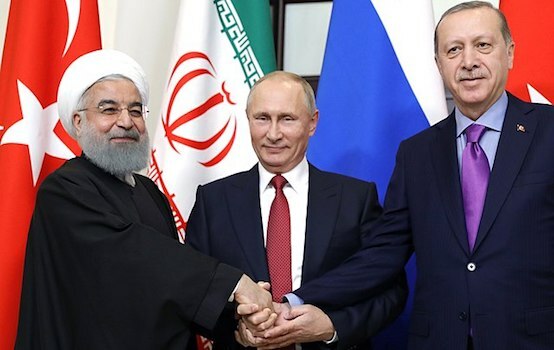 This visit may bring benefits both to both the Iranian-Armenian relations and to Iran’s relations with the Eurasian Economic Union (the EAEU), which include among its members are Armenia, Belarus, Kazakhstan, the Kyrgyz Republic, and Russia. 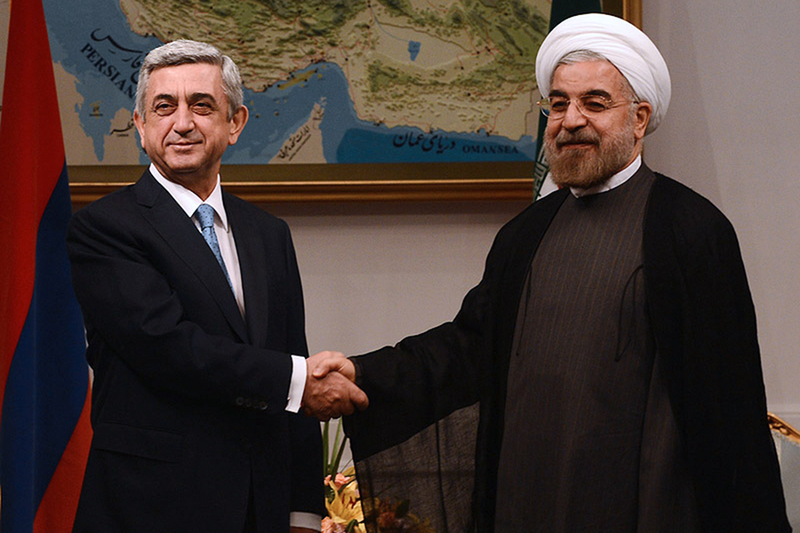 Iran and Armenia have communicated maintained mutual relations for many centuries. Today, the Republic of Armenia and the Islamic Republic of Iran are credible stable political partners. The twoBoth countries set the goalaim to strengthen the economic interactionrelations, which haves weakened after a long period of the international sanctions imposed on Iran due to its nuclear program. NowPresently, when after the lifting of most of the international sanctions are lifted, Iran is now rebuilding relations with and iits old partners are rebuilding relations. The major subject of theDuring their negotiations, between the Iranian and Armenian leaders was thediscussed trade and economic cooperation. In this context, they also discussed the issues related to transport. The project of “the Persian Gulf – the Black Sea” Iinternational Ccorridor project was discussed. As it is known, Armenia is already participatesing in the project of the North-South International Transport Corridor project. The main route of for the North-South International Transport Corridor runs from Iran to Europe via Azerbaijan and Russia, and it has the Armenian direction link aimed to connect Iran and the Black Sea via Georgia with the help ofby railways. This route will help Iran deliver its goods to Europe at a maximum speed and minimum expenses, and it will increase the intensity of trade intensity in the region. In addition, tThe pPresidents of Iran and Armenia also touched on the topic of Iran’s economic integration into the EAEU. According to Hassan Rouhani, the fact that Armenia is the an EAEU mMember brings great prospects to the Iran-Armenia cooperation great prospects. In this respect, Iran and Armenia are especially attractive for each otherhave special mutual interests. Iran intends to expand its economic relations with the entire EAEU via Armenia, and get gain access to the Black Sea. Being As the sole mMember of the EAEU , which sharesharings borders with Iran, Armenia intends to become an intermediary, with reaping all the bonuses that thisit impliesentails. TheA prospect tof createing a free trade zone between the EAEU and Iran is the very most attractive one for Armenia. Iran, rich in oil and gas, is one of the most economically developed countries of the Middle East, and the creation of the a free trade zone between it and the EAEU will turn Armenia into one of the key mMembers of the Union, and will enablinge it to earn benefit on the transit traffic. Increased trade between the EAEU and Iran will require the creation of the relevant infrastructure. This is shall also be advantageous for ArmeniaArmenia, as it the nation has long wished to establish an exintensive transport connection with Iran for a long time. In 2014, tThe project of Armenia-Iran railway was approved by the Armenian government in 2014Armenian government approved the Armenia-Iran railway project. H, however, ithis was not implemented due to the lack of funds. The complex mining excavation activities require about 3.5 billion dollars. If the a free trade zone is created between Iran and the EAEU, all the Mmember Sstates of the Union will invest funds into constructing thise railway construction. InAt the end of the meeting, Hassan Rouhani and Serzh Sargsyan announced to the media that the relations between Iran and Armenia remained warm and, friendly, and they wouldwill be extendedcontinue expanding in the future. They expressed reiterated their intention to develop the regional infrastructure again in order to increase the goods turnover and strengthen cooperation in the sectors of industry and power engineeringenergy. The bBoth pPresidents expressed their desire to continue participatingion in the development of the North-South International Transport Corridor. The heads of Iran and Armenia also reported that they attached importance to the continued negotiations between Iran and the EAEU on the creation of the a free trade zone. As one of the most interested stakeholders, Armenia has long been promotinged the idea of an Iran-EAEU free trade zone as one of the most committed parties for a long time. In 2015, it the nation addressed the Eurasian Economic Commission with a proposal to discuss this project. Yerevan declared that it was ready to become an intermediary in the negotiations between the EAEU and the Islamic Republic of Iran. In March 2016, Vache Gabrielyan, the Deputy Prime Minister of Armenia, declared the creation of a working party to for the purposes of analysinge all possible consequences of the establishing a free trade zone establishment for each country of the Union, and highlighted that the discussion was had been initiated by the Armenian party. In October 2016, Minsk hosted a meeting of the Eurasian Intergovernmental Council was held in Minsk, where the Prime Minister of Armenia, Karen Karapetyan, reported that the a free trade zone with Iran would bring benefits to all EAEU States. In generalOverall, Russia, Belarus, Kazakhstan, and Kyrgyzstan support Armenia’s incentive. However, the establishing a free trade zone establishment requires a long period, during which all the states should agree on their interests. Therefore, to start gaining profit from the cooperation with Iran, Armenia has decided to create an Armenia-Iran free economic area zone, without waiting for thea decision on the a free trade zone zoneand to start gaining profit. The joint ventures of between Iran and the EAEU states will operate be conducted in the city of Meghri on the border between Armenia and Iran. Products of these enterprises will be free from theexempted from customs duties under when deliveredies to markets in the the EAEU markets and Europe, which provides Armenia with a number of tariff preferences under the GSP+ system. It should beImportant to note here isd that under these circumstances, the Republic of Armenia has a chance to become an intermediary in the current situation bothnot only between Iran and the EAEU, but also between and Iran and the European Union. Iran is a very attractive trade partner for Europe as a trade partner. However, some differences of betweenthe Iranian legislation and legislation in the the banking system from the European banking system ones complicate cooperation. Armenia expects that Europe will trade with Iran via Armenia when After it establishes the the free trade zone with Iran, and after the railway communication link between the Persian Gulf and the Black Sea starts operating, Armenia expects Europe to conduct its trade with Iran via its own corridorson. 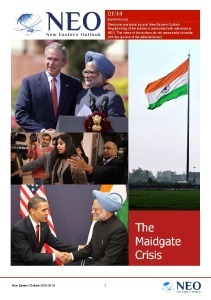 Such a scenarioThese developments will affect both the regional and the global economyy. After all, iIf by that time the economies of Iran and the Eurasian Union manage to integrate by that time, the strengthening of the trade relations of between Iran and Europe will result in the improved ties between Europe and the EAEU. This may lead to the weakening of the US influence in the European Union. It should be recalled that now the USA is presently trying to impose the Transatlantic Trade and Investment Partnership on Europe, which many European experts believe to be very unprofitable. It may happenis not wholly implausible that in the course of time, the European Union will find the cooperation with the EAEU will become moreincreasingly attractive for the European Union in the course of time.